The "Third Door" would suit all government, private and mining applications. 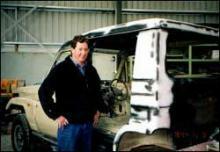 We can do various body designs including six wheel drive and crew cab. 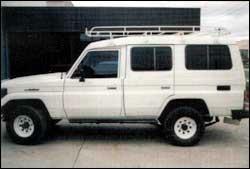 Turn your Landcruiser 75 Series Troopcarrier into a more practical and versatile vehicle. Dual cab conversions using the 3rd door. 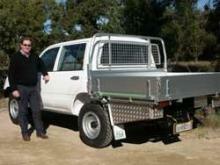 This makes a unique 4WD vehicle for farmers, 4WD drivers, mining and government departments. A tray top can be fitted, giving the vehicle a huge variety of uses. Ring Bill now to discuss your specific requirements. New door opening/aperture is made out of 3mm laser cut panels and fully welded in place. All internal panels are zinc primed and, after job is completed, sprayed with internal body wax coating. The door hardware is from the front left hand door (which is second hand). The original sliding window is used and the frame cut down to suit the door. Repainted in two pack acrylic enamel, inside and out. The third door conversion takes three weeks to complete. All work fully guaranteed for 12 months on workmanship and materials. 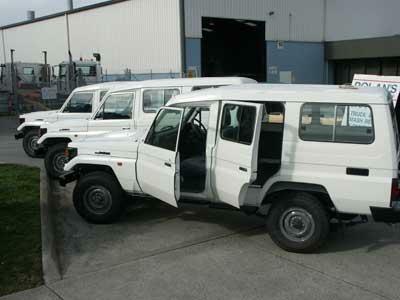 We can make Toyota Landcruiser 80 and 100 Series and Nissan Patrols into practical dual cabs with tray fitted. They are also available as six wheelers (4WD or 6WD configuration).